MARINA DEL REY, CA--(Marketwire - January 7, 2011) - Those who resolve to live happier and healthier in 2011 can find the ideal waterfront residence at www.TodayMarinadelRey.com, the premier site to learn about Marina del Rey, its lifestyle and to find an apartment by the water. Tucked along the Pacific coastline and minutes from Los Angeles, Santa Monica and Venice Beach, Marina del Rey offers its residents an effervescent Southern California lifestyle with stunning harbor views and endless activities. Helping visitors to enhance their Marina del Rey experience, the E&S Ring family of properties provides a vibrant marina lifestyle for work and play, from waterfront apartments and on-site boat slips to concierge service and other first-rate amenities right at home. Esprit Marina del Rey, one of the most exclusive and desirable waterfront properties in the Marina, is extending holiday cheer by offering new pricing for a limited time -- apartment seekers are encouraged to call for details. Marina del Rey residents can also delight in the new, on-site Breakwater Bistro at Mariners Village. Featuring healthy, organic fare, Breakwater Bistro offers unique, grab-and-go meals like kobe burgers, Asian salmon salad, rib eye pizza and vegan options -- all conveniently delivered to residents living at E&S Ring properties in Marina del Rey. The Villa Apartments at Marina Harbor offers breathtaking features, from the well-equipped fitness studios to the anchorage facility mooring luxury yachts. Complete with stainless steel appliances and in-home washers and dryers, luxury reigns supreme at The Villa. And with sweeping panoramic marina and garden views, Bar Harbor Apartments features heated swimming pools, gyms and private saunas for year-round activities. E&S Ring properties include Bar Harbor Apartments, Esprit Marina del Rey, Mariners Village, The Tides and Waters Edge, and The Villa Apartments at Marina Harbor and amplify the haven of Marina del Rey with personalized customer service and resort-caliber amenities. Amid lush landscaping and serene seascapes, residents are steps away from retail shops, restaurants and the energetic Los Angeles nightlife. Three of the five properties also provide coveted boat slips, offering unequaled on-water support and effortless marina channel access. Each waterfront apartment community offers a range of leasing rates and a variety of indoor and outdoor activities, including achieving personal fitness goals on properties designed for easy access to water sports, on-site fitness centers, heated pools, spas and saunas, to list a few. A recreational Pacific coastal playground, Marina del Rey is a scenic retreat from city life while still centrally located near major corporate and office hubs, LAX and exceptional hotels, such as The Ritz-Carlton, Marina del Rey. 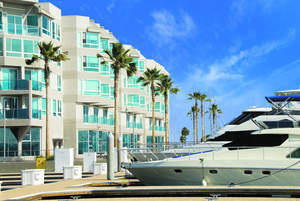 Comprised of five leading Marina del Rey properties, www.todaymarinadelrey.com is owned by E&S Ring, a family-owned management corporation with quality apartments throughout Southern California. Boasting over 50 years of superior service, E&S Ring is well known for its strong customer service, generous amenities and its focus on residents' needs. For more information on Esprit Marina del Rey, The Villa Apartments, Mariners Village, Bar Harbor Apartments or The Tides and Waters Edge, please visit www.TodayMarinadelRey.com. Esprit Marina del Rey, one of the five properties that can be found at www.TodayMarinadelRey.com, offers first class amenities and breathtaking water views from every floor plan. 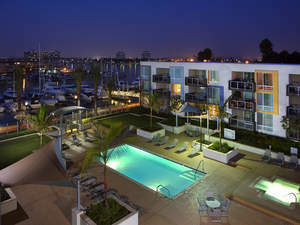 The Tides and Waters Edge in Marina del Rey features waterfront apartment units, jogging paths and modern luxury living. For more information, please visit www.TodayMarinadelRey.com.